For me the project becomes more and complex. So in this blog post I will try to give you an overview of different aspects of the project around the Silence Suit, the correlations of these aspects and my difficulties with this complexity. To keep it concrete, I will first explain to you what we did today. I helped Danielle to develop further the button I introduced to you last time. We learned that it is not necessary to use this button to mark an exceptional experience while meditating. But we want to use it to mark a moment when something in the environment changes. Think about the changing of light or loud noise. We want to mark the moment in your timeline when something happens which influences your meditation session so you can see later the impact by analysing your data. So we try to include the button in the suit as comfortable as possible. First we thought about a glove, but now we found out that a ring should be better. The button has to be as small as possible. 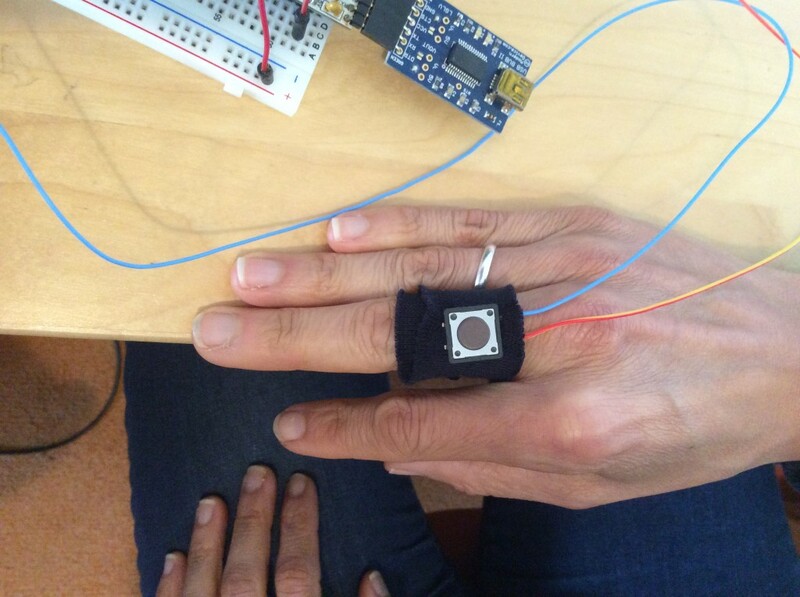 We also think about assembling the button like we made the sitting sensor with conductive fabric. That would make it much more comfortable if there is no hard piece on the ring. But why is it not necessary to mark an extraordinary positive experience anymore? That has to do with the artificial intelligence of the software. I find it difficult to understand how it works precisely. But we learned from the data scientist that the software will learn itself what a good meditation session is. To make it a learning system you need many baseline measurements. A baseline measurement means that you track your meditation session without any actuation. 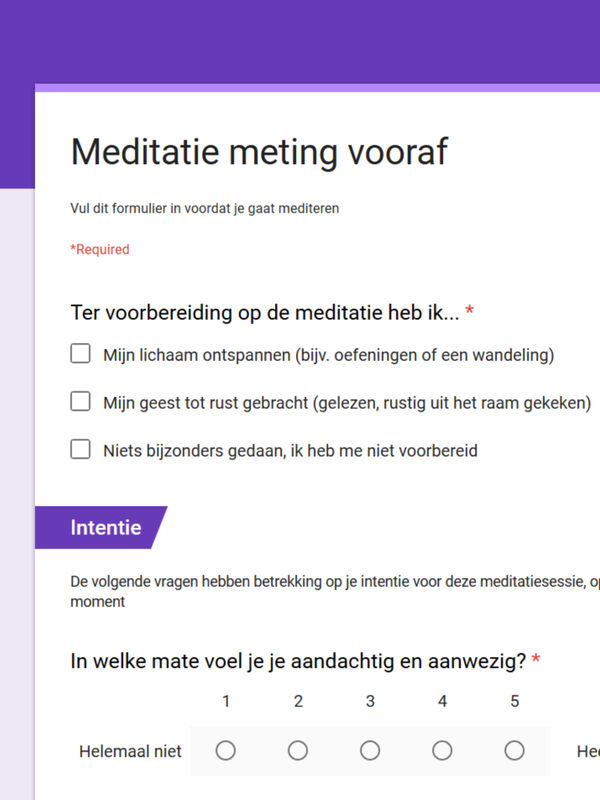 Before and after meditating you have to fill in the questionnaire developed by Danielle in consultation with different experts. She has formulated many questions which are relevant. By detecting a minimum of 30 sessions in combination with this questionnaire the system can start to figure out which aspects are the most important to make it a good session. It is important that the data are correct so you can utilize them in a scientific way. That is among other things one aspect which makes the project so complex. On the one hand it is a scientific research. On the other hand the suit arises from a design mentality, which intends to make it as chic and as comfortable as possible at the same time. Otherwise the user will not use it for his own scientific research. Furthermore, Danielle has her vision as an artist to bring all these disciplines together to create a completely new and unknown outcome. The Silence Suit is actually a small part of the bigger vision of Hermitage 3.0. But how does Danielle handle the complexity of her vision? I think one aspect is among others that she assumes different kind of roles in the project. At one point she assumes the role of the researcher and at another point she really thinks as a designer. That makes it possible to keep the complexity. To deepen different aspects, she asks different kinds of experts for help. That is also how she worked to develop the wire frames. We have to think about what the screen will look like, so that the user will know how to use the database for his own interests. First, Danielle assumed different kinds of roles as users. She developed a costumer journey for each user. 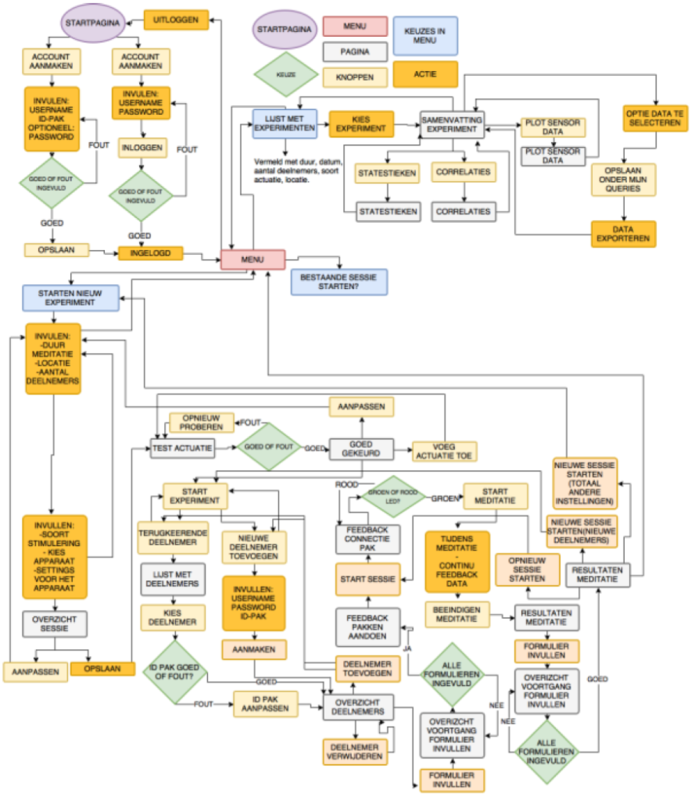 From this costumer journey an expert has created a flow chart. That brings the costumer journey to a more abstract level. The flow chart serves as an intermediate step from costumer journey to the wire frames. The wire frames will finally indicate the functionality of each screen, so that every user can use it for his own interests. So as you can see there are many things in development. Many things are going well and every team member is working hard to bring the Silence Suit to a higher level. Of course, there are still many things which have to be explored, but that keeps it interesting. I find it really nice to see that after so many organizational problems in the beginning, we really make great steps to realize a meaningful research project. Next week, we will visit the DesignLab Twente where we will meet Vera de Pont to bring the electronics and the new design of the suit together. I am really excited about that meeting and I hope to give you another inspiring insight in our project next time.